The Popular Music Studies Reader maps the changing nature of popular music over the last decade and considers how popular music studies has expanded and developed to deal with these changes. A wide range of international contributors featuring some of the biggest names in popular music and cultural studies including Philip Auslander, Paul Gilroy and Kodwo Eshun and discuss:* the increasing participation of women in the industry* the changing role of gender and sexuality in popular music* the role of new technologies, especially in production and distribution* the changing nature of the relationship between music production and consumption. 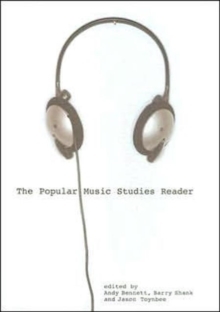 The Popular Music Studies Reader places popular music in its cultural context, looks at the significance of popular music in our everyday lives, and examines the global nature of the music industry.